The Borzoi listed below are available to qualified homes. In addition to plenty of love and care, we require a fenced yard. Available to a show/breeding home. From our breeding of Doppel/Barbee. We have plans for a Borzoi litter in the near future. If you would like to be placed on a waiting list, please feel free to fill out our online questionnaire form. This helps us determine what you are looking for and what may fit your desires best for optimum placement of one of our Borzoi.If we do not have puppies or young adults available that suit your requirements or desires, we are happy to refer you to other ethical and friendly Borzoi or Silken Windhound breeders who may have something available. On occasion we may have other Borzoi available for placement that may not be listed here. Please contact us for any details and availability. For more information on our Borzoi or our requirements, feel free to send us an email. Another good source of Borzoi breeder information is the Borzoi Club of America Breeder Referral Program. You can contact the BCOA breeder referral representative, Karen Mays, at karen@zencor.com for information on Borzoi breeders in your area. 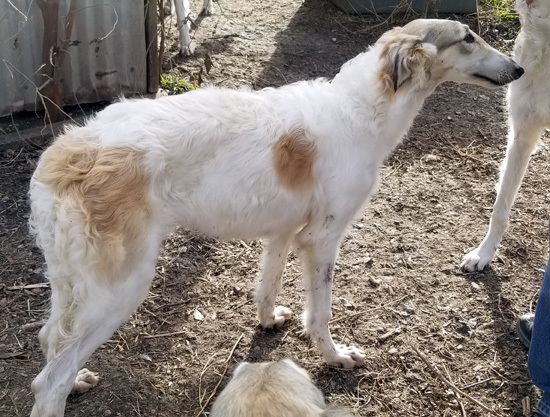 Also, Borzoi Rescue-Northern California (BR-NC) also has a Referral Program which helps breeders place their Borzoi through their organization. You may wish to check their website for possible available Borzoi. We support BR-NC through the Amazon Smile Program, which donates a percentage of our purchases to BR-NC. You may wish to consider sponsoring them as well to help support the good work they do in rescue and through their cooperation and support of responsible Borzoi breeders.